Social media is a great tool for businesses. If you don’t believe us, you might be living under a rock. One of the most beautiful things about social media is that it works for businesses of every size. Just because one company is smaller than another doesn’t mean their reach or potential is limited; it’s all in how you run your strategy (and make no mistake, there is some planning and strategy involved if you want to be successful) and how well you use the tools at your disposal. As a vacation rental host, you may not have considered how maintaining social media accounts can help your occupancy rates. While not all platforms are created equal and aren’t always right for every situation, for vacation rental hosts, Instagram is always a smart choice. Because it uses tools you’re already using in hopes of increasing your occupancy rates on your listing platform, like Airbnb or HomeAway. You don’t have to be a social media wizard to get some traction out of using Instagram for your vacation rental business. On the contrary, the work is easy and can be fun. Here’s how to set up and start a killer Instagram account for your vacation rental business. Yes, you will have to do a little work on the backend to get the most out of your vacation rental Instagram account. However, unlike your math or science homework, this should be pretty easy. How many followers to each of these pages have? What kind of things are they writing in their descriptions? What kind of hashtags are they using and what hashtags are you seeing over and over – not just in a single account’s posts, but from account to account? Are they using any of the same hashtags? Which images are getting the most comments and engagement? What do those posts say? How does the account manager (the person who posts the images and writes the text) respond to comments, if at all? There’s a wealth of knowledge in these things that you’ll want to use to your advantage. We recommend taking notes! 2. Set up a new account. You don’t want to be running your vacation rental account from your personal account, though it’s okay to add things from your business account to your personal account every now and then. The key is to keep them separate and keep your vacation rental account focused on your rental, not on you. It’s best to have separate accounts and to choose a handle (name) for your biz account that describes your place. Instagram’s app will usually let you toggle between multiple accounts so you shouldn’t have to log out and back in very often, if at all. 3. Begin with what you already have. Once you have an idea about what is bringing more and more followers to your bigger competitors’ pages, you can start to replicate what they’re doing. After all, imitation is the sincerest form of flattery, no? Start by using the professional photos you have of your home. You can add these to your Instagram account – we recommend individually and not in a “carousel” so you have more to share for later down the line – and include relevant hashtags. Start by resizing the images as the original files are probably huge. From the left, choose “Resize.” We recommend going with something no wider than 1,000 pixels. If you type this into the first width box and click out, the height will automatically adjust for you based on the original ratio of the image. Download a cloud storage app like Google Drive, Dropbox, Apple iCloud, or similar system to your smartphone where you already have an active account. Make a new folder in your cloud storage for your Instagram photos and load all your newly resized files there from your computer. Wait a few minutes; depending on your internet speed, this could take a while. Voila! Now your photos are accessible via your computer internet connection and your smartphone app of the same name. NOTE: Depending on your phone model, Instagram may not be willing to take image files from your cloud sharing application. If that’s the case, simply save them to your phone image folders as needed where Instagram can access them. Remember all that research you did in the beginning? Now’s the fun part – searching for opportunities to post things that are similar! Look for what you think guests would be interested in that’s around your place and go to town. 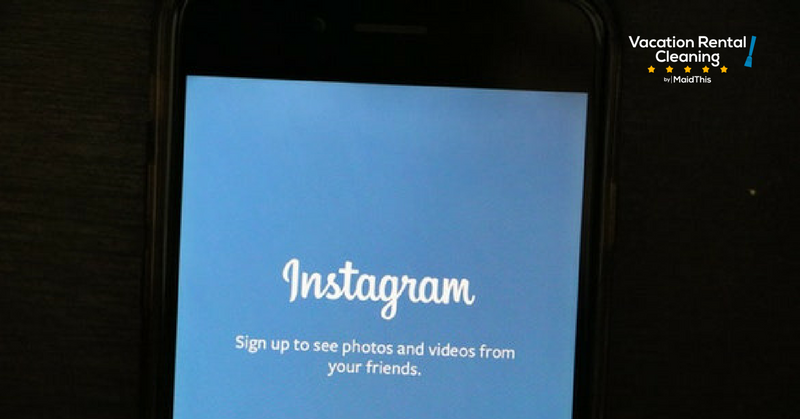 Use Instagram’s video function or simply snap pictures. Add hashtags. If you need help, go back to those other accounts you spied on from before and borrow their ideas. Now that you’ve started an Instagram account, make sure you’re keeping it up. You don’t need to post something every day – that might actually be too much – but you should aim to post something every week at least once. Remember to use other industry accounts for inspiration if you get stuck, but don’t let more than 7 days go by without sharing something. See what we mean? You don’t have to be a rocket scientists to make Instagram work for your business. It does take a bit of elbow grease and consistency, but it just might lead you to more success with your bookings when done right.